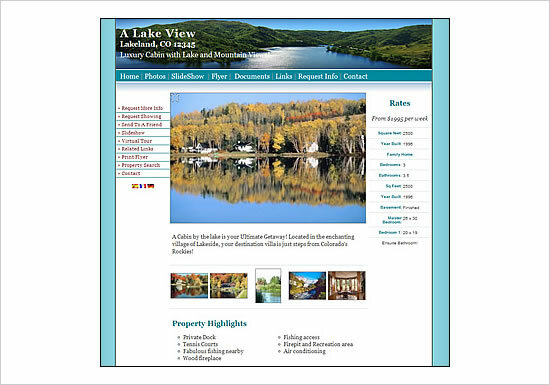 Marketing Rentals with a Property Website! Our Site Builder wizard means there simply isn't an easier or more cost effective way to market your rental property. SPS is a fully automated real estate marketing tool that guides you through each step, allowing you to simply and quickly create a gorgeous web site, with unlimited photos and a virtual tour, all about your rental property. With SPS you are in total control and you can make changes any time you want. We provide a 1-click solution for posting your rental property flyer to craigslist so you can get in front of your target tenants! SPS is an easy way to showcase all automatically market all your rental properties to tenants looking on craigslist and other portals. As well as all the regular features, the following features help you to market your rental properties. Each Rental property website remains LIVE for FREE when the property is rented! and so on... See complete price list.